There are five organizational actors in the downtown makeover campaign who go relatively unappreciated. They reside in city government, in media, in associations, in professional and industrial firms, and in various informal milieu that share the same agenda, which is a social-climbing agenda. Unhappy with the citizenry as it is, they set about converting our downtown into a “world class” commercial utopia for high-end corporate chains and an imported population of fellow social-climbers. Their mentality was that of the bubble. Inflating downtown real estate was at the heart of their fantasy plan, small business and local renters be damned. Public space, the commons, be damned. Now, as the bubble bursts and “developers’ dreams turn to dust,” what will be the future of downtown, and who will make this future? Portland is just one US city that has had its industrial base ripped from under it. What can a city do to survive? Other desperate local governments have gone the way of Portland. Cities try to develop educational and medical establishments, enhance tourism, attract high-tech industries, develop retail, install major-league sports, develop, promote and inflate real-estate, and develop the retail, office, and entertainment potential of the downtown core. Boosterism rules. Babbitry thrives. Planning bureaucracies develop. The guiding light of booster-inspired city planning is a floating community of professional planners who have the same academic education, attend the same conventions, read the same journals, follow the same fashions, and have no local roots. In recent years this national college of planners has been charged with a European-style remaking of big-city downtown USA. While the underclasses are pushed into the far suburbs, the downtown is gentrified into a high-security complex of upscale chain hotels, shops and restaurants dedicated to the rich and spendy. Portland planners cannot stop congratulating themselves on the so-called Pearl, which is right on the mark for The Plan. Meanwhile, they find it imposssible to apologize for the hubristic flops at South Waterfront and Moyer Tower. “Developers’ Dreams Turn to Dust.” A well-turned headline, a nice alliteration. Twice ran this head in the Oregonian, first in mid-2008, as various developer’s projects failed, and again in March, 2009 as the kicker head in the print article announcing the halt of construction on the biggest and most pretentious developer dream of them all, Moyer Tower. The block (still officially Park Block 4) is now a 70-foot hole, from which protrude the naked steel core-columns of what was to be a 32-story frame. Ground Zero indeed. So now what? Will the same ruling entities continue on in a depressed economy? Will the boosters and their institutions stay entrenched, waiting for the big turn-around, so they can recommence with the old gentrifying plan? The slump has brought no curtailing of the old hubris, which includes a re-renovation of PGE Park, a new globalist sports attraction, a demolished Coliseum, a new stadium, a Columbia River Crossing. It may be of value to share what I learned about some of the institutions that rule development downtown, for they may not fade away anytime soon. Most know Portland’s chamber of commerce, those boosters called the Portland Business Alliance (PBA), notorious for sit-lie and for fielding their own gun-toting police force. Most know about the Portland Development Commission (PDC), the infamous financing arm of urban removal. But how many know the other PDC, the Portland Design Commission, which has the power to approve development projects and which may be more responsible than any other agency for rubber-stamping the downtown makeover? What about the Planning Commission? It has ducked out of the chain of decision-making on specific projects and occupies itself with lofty “visionings” and long-range planning for specific neighborhoods. The Central City Plan, the legal framework for the downtown makeover campaign, is an example of the Planning Commission’s developer-friendly work. The City Council? An unabashed booster of all development, the Council takes deserved public heat on the make-over campaign’s civic consequences, and then does nothing. At a downtown meeting I heard a councilman talk on homelessness for an hour and never once allude to development. But isn’t inflationary development the root cause of homelessness? No, say the politicians, it’s drug addiction, alcoholism, and mental illness, and certain programs are required. The Council hears specific development projects only on appeal. The fee is $20,000, unless you are a certified neighborhood association. The above entities are well known. Here are some other less notorious institutional players who also deserve some notoriety. 1. The Portland Design Commission. An obscure technical panel of mostly architects, this commission is empowered to be the sole reviewer of all proposed building projects in the city. This little-known “other PDC” is a key nexus in the rigged city-developer transaction. The Design Commission, appointed by the mayor, is the theoretical point of public access, comment, and intervention on building-project issues. This panel would prefer to work behind closed doors but is legally forced to conduct perfunctory “hearings” where it is deaf to the vocalizations of the public. A Design-Commission hearing is a cozy, barely audible conversation between the commissioners and the developer’s architects. If the architect, in his role as lobbyist and promoter, wishes to turn the hearing room into a stage-set for an infomercial for his product (by draping the area with huge blow-ups and by screening video simulations) this is no problem for his friendly professional associates on the Commission. Most of the design commissioners are architects themselves. It’s a little club. Is every project of consequence the Design Commission decides upon already decided more or less secretly by others from above? This was certainly the case with Moyer Tower, and it is demonstrable in the Record. In league with the developers, bureaucrats, and architects are prospective contractors, who have an obvious interest in a project getting city approval. Contractors extol the project, and employees of contractors are recruited to testify at hearings, where they pose as public. This stratagem is getting more sophisticated. One ringer posed as an objector to Moyer Tower at a design hearing, then showed up later at the appeal to testify that he had seen the light and had learned to love the project. The Design Commission is part of a planning bureaucracy administrated by the Bureau of Development Services (BDS). The Commission does a routine check-off of a developer’s plans against such planning codes as the developer-friendly Central City Plan. The obscure Design Commission is shy, likes to stay obscure, and gives only the most perfunctory notice of its hearings to the public, if any. You would think that a 32-story skyscraper would merit a notice to neighbors across the street, but I heard of the first design hearing only by accident in talking to our district planner about another matter. Partly by design, the Design Commission is rarely exposed to any public comment, protest, or intervention and thus has become impenetrable and smug. If you are fighting a development, it would be a good idea to take a bunch of folks into their chambers and speak up loud and clear. This should wake them up, and maybe your cause will get noticed. You can expect at least to protract the process, for, being noticed, the commissioners and staff will now run around covering their asses in all directions. 2. The Downtown Neighborhood Association (DNA). This would theoretically be a place of recourse for impacted downtowners, but DNA apparently has put itself at the service of developers and of the social-climbing ambitions of the PBA, so there is no balance, no counterforce, no equity. (Other neighborhood associations may be similarly infected. Yours?) I went to a DNA meeting to protest Moyer Tower and found myself in an up-with-Moyer-Tower rally with the architect singing hand-in-hand with officials from PBA and the Portland Planning Bureau. Like PBA, the DNA has put downtown under a continuous orange-to-red high-security alert. Security concerns ride on all DNA meeting agendas, and cops are frequent speakers. All of the powers in this game, have been friendly to a hypothetical population of affluent consumer-oriented imports who would regard their adopted city as another tourist destination. The makeover campaign was designed to attract this affluent, rootless demographic. Its spending power is desirable and so is its political apathy. The model, of course, is the so-called Pearl District. The existing population is too funky for downtown and must be priced out and policed out. DNA had no problem with the PBA’s plan to remake downtown into a high-end, high-security shopping mall. This social-climbing movement may now halt, in despair, as the condo, office, and retail sectors crash. 3. 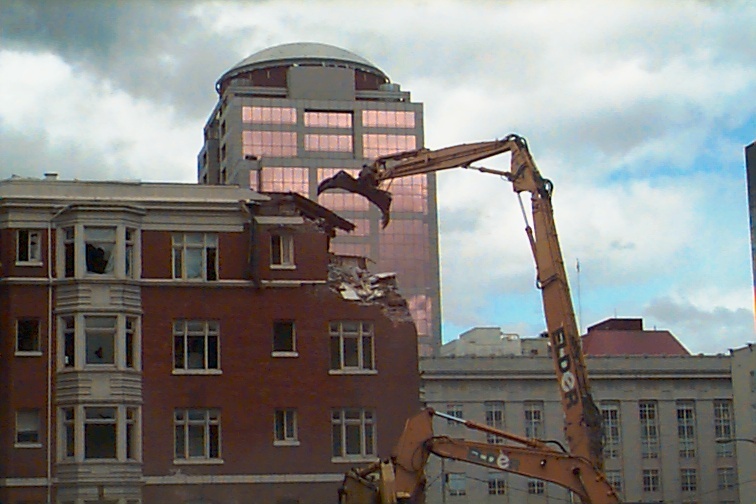 The Portland Tribune (“The Cement Mixer”). The Tribune is just one entity in one local media conglomerate which has quietly bought up most of the little neighborhood papers in the city, like the Examiners and The Bee, putting the publisher in a position to promote any project and to manage any dissent against development citywide. Judging from my own experience, the Cement Mixer can interview an activist for 90 minutes using two reporters and never publish a word, suggesting that the paper may have a secondary intelligence mission. When developers have an eye on some unfortunate old property, the Cement Mixer moves in to demonize a Grove Hotel, a Cindy’s, a Civic, a Golden West (or the regulars at the old Virginia Cafe (See “The Virginia Cafe Meets the Cement Mixer” at Writings). The paper hypes old problems, invents new ones, and declares a crisis, so city inspectors and police can march in to write citations, which the paper will trumpet in its news pages. If you see some suit roaming your building shooting ash-tray crimes with a macro lens, it’s the Cement-Mixer, and the wrecking ball is near. Property secured, and tenants out in the street, the Cement-Mixer can then proceed to romance the favored developer’s new project, to fog its social and environmental impacts, and to paint it sustainability-green. The Cement-Mixer hypes the developer, his architect, and his enablers in city government. Behind a colorful veil of plausible journalism (much of it of value), the Cement Mixer functions like a trade paper whose sole reason-for-being is to promote up-scale development and to sell cement. The Tribune’s “coverage” of Moyer Tower in the making was no less than ecstatic, hundreds of column-inches of hype for Moyer’s snooty Park Avenue West, but the collapse of the project, like the resistance to it, got not a word in the paper’s print edition on the street. As development halts, the Cement-Mixer may lose its reason-to-be and cease publication. It has already dropped from a multi-section imitation of a daily (a stupid publishing decision) to a single-section weekly. The DJC is the other local developer-friendly paper. A trade publication, it can only be found in print downtown at Rich’s, in a few news-boxes, and on line at djcOregon.com. Primarily in the business of publishing legally required public notices, the DJC (the local subsidiary of a national chain owned by Donlan Media) runs a few front pages of local news of interest to developers, architects, contractors, real-estate agents, politicians, lawyers, and You. In 2006 I witnessed some of what passed for public discussion on the downtown transit-mall-makeover issue. TriMet’s massive high-impact project, driven by $200 million in federal funds, is a bridge-to-nowhere, having no demonstrable transit-flow benefit for the new Green Line or anything else that would justify the massive expense and disruption at this time. Nothing was broke that it will fix. The transit-mall makeover is another up-scaling, real-estate-value-raising, social-engineering project, this time aimed at the so-called “backbone” of downtown. Structures along the new mall are getting upgrades. The funky Portland populace will have few places to hang out in the new high-security, anti-people mall, where there will be fewer stops, offering only minimal protection from wind and rain, unlike the old shelters, which have been destroyed as security liabilities. “Gangs Find New Turf,” screams the Cement-Mixer, before the new mall even opens. (Definition of “gang:” Three or more people standing on a street corner, not in suits.) Behind the new high-security transit mall and other planning, is the criminalization and displacement of any public hanging-out space. This is part of the agenda, the destruction of public space. Consider the planning of Park Block 5, soon to open. Most of the area has been displaced by an oversize “water feature” (for which the developer claimed a FAR credit) and by a restaurant, which security-minded planners appreciate because it put “eyes-on-the-street.” Planners design for a fear of people. TriMet, spurred on by PBA and the Cement-Mixer, is out to fight a fictional MAX crime wave and has stationed on the Blue Line all these formidable 300-pound cops, who are intended to console the condo class but who really make everybody feel uncomfortable. TriMet police have a rank for which the uniform is head-to-toe black with jackboots. With the destruction of public space comes the destruction of all public process. In place of public participation comes public relations. To decide the transit-mall issue, no government process was in place outside of the TriMet bureaucracy itself. This disruptive plan was executed over huge public protest from many qualified professionals (consultants, engineers, transit specialists) who expressed themselves eloquently in the few phony public forums allowed. The bus-drivers’ union also opposed the makeover. No driver I talked with was in favor of it. TriMet held one little “hearing” before its own board at the agency’s annual open house. DNA held another mock hearing at City Hall, and finally decided against it. But there was no review by any accountable public body officially empowered to vote the massive project up or down. TriMet’s proposed destruction of Fareless Square, of four bus lines, of many established runs will also be a strictly internal decision. TriMet fields well-paid cute young ladies to explain makeovers and fair hikes to riders and apartment dwellers, but there is no democratic process, just expensive PR, paid for by raising fares. The up-scaling of downtown, the Mall makeover, and the movement to kill Fareless Square are all part of the same destructive social-climbing campaign. Where is resistance to the organized force represented by the above-named entities? Some of our local political energy is directed to other development threats out in the neighborhoods. But in the progressive city-politic, local issues are not very trendy and do not compete well with fashions like global warming and peak oil. A gentrified politics is unlikely to get down, dirty and confrontational with development issues. Downtown long ago has been written off by many in the politicized community anyway. My own activist experience on Portland city issues spans only a couple of years, my prior experience on a land-use issue being elsewhere and twenty-five years ago. I lived in the center of downtown for less than six years (of my twenty in this city), but during this time I witnessed first-hand the destruction of some fine old architecture and affordable housing, like the Rosefriend Apartments (photo). Meanwhile, the homeless slept in doorways on my midtown block. After the art museum upscale, all the homeless and the young were driven from the shady comfort of the South Park Blocks by police action (at least once at gunpoint, according to a witness). The campaign has destroyed many traditional downtown businesses within just a six-block radius of my midtown residence: an historic and affordable department store, all the old affordable and unpretentious hotels and bars, a bathhouse, two nightclubs, a bagel shop, a healthy bakery, two juice bars, and the only real thrift shop (the Council) is gone, replaced by an overpriced Goodwill boutique. In the hubristic boom-times of the boosters, many of downtown’s high-brow cultural institutions became over-developed, inflated beyond sustainability, and are now precarious. The social-climbers, who boast in the Cement-Mixer that they are building “a vibrant 24-hour city,” attempted, with the aid of City Council, to close down the neighborhood’s only 24-hour convenience store, Petersons, which has the misfortune of being located across the street from PBA’s most-treasured retail acquisition, Brookes Brothers, which itself has the misfortune of being located in a dead mall, in a construction-sacrifice zone, and in a city not so tweedy. So the store complains, the PBA complains, the Cement-Mixer demonizes “criminal activity,” and the City moves to evict. Under public pressure, the Council granted Peterson’s a reprieve. The very next day the PDC announced that the structure that houses Peterson’s would soon be demolished for a 25-story condo tower. The structure has been a target for years, its main offense being that its architecture provides shelter from the rain. Such shelter is to be removed under the new plan to thwart any hanging out. The new approved upscale awning, for example, is set high with a steep slope and minimal extension for shelter. At the one surviving local hang-out, Portland Coffee, all of the outside seating has been ripped out by PBA demand. No informal hanging-out public space is allowed in the new gentrified downtown, except for the gentry. Public space is not in The Plan. Pioneer Square is no longer a public space; but an uptight, over-policed, commercial-exhibition venue, and no smoking, please. (And what happened to the traditional New Year’s Eve party in the Square and the fireworks display that I could watch from my apartment?) Waterfront Park has also become an exhibition venue and will become the new home of the Saturday Market, which is being displaced from its traditional location by some tourist-oriented PDC development. The 32-story Moyer Tower itself is another expression of disrespect for public space. That project’s bulk was planned for twice the floor-area-ratio (FAR) allowed in the neighborhood code. How did the developer finesse a doubling of bulk? The Central City Plan allows for floor-area-transfer, so developer took that presumed bulk from Park Block Five. I argued up the chain that a park, by definition, is an open public space which has no FAR to transfer, that the air-space had been fought for by citizens a decade ago to fend off a 12-level parking garage, a fight that resulted in the plot being officially certified as a park in no fewer than five city ordinances. I argued that the FAR transfer was a theft of hard-won public space. Does a park, defined everywhere as an open public space, have any FAR to transfer? No civic body, not the Design Commission, not the City Council, not even the state Land Use Board of Appeals (in Trinkaus v. Portland) would condescend to rule on that issue, which they eluded in decisions that ran on for many pages. For public space there is no respect. The Nines hotel, which is for CEO’s and jet-setters at $300 per night and up, up, up, opened in October ’08, as the economy collapsed. The pretentious project opened with liens upon it for failure to pay subcontractors and in arrears on its construction loans. Never mind, the downtown Babbits were as thrilled with the city’s acquisition of The Nines as with Brookes Brothers. The Nines, a unit of Sage Hospitality, is located within the drastically renovated Meyer & Frank building (also the site of a new over-priced, over-lit, and under-patronized Macy’s) and has its entrance opposite a sanitized Pioneer Square. Upon The Nine’s grand opening, the spokes for the Sage Corporation boasted in the Cement-Mixer, “The Nines is the tipping point for gentrification in downtown Portland.” Elsewhere in the English-speaking world “gentrification” is a pejorative, but apparently no longer here in Portland. This may be an auspicious time to change the vocabulary and the mentality and the agenda that goes with it.